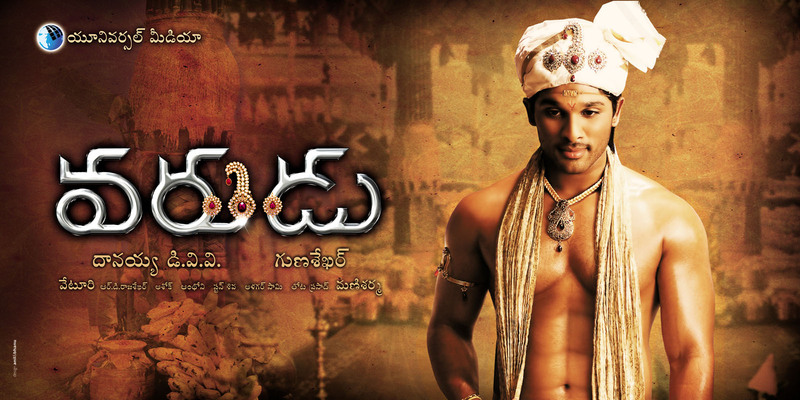 It seems to be an appropriate time to celebrate all things Allu Arjun – recent wedding anniversary, 10 years in the movie business and his upcoming birthday – so I thought I’d take a look back at Varudu. Not one of his more successful films in terms of the box office, but still one of my favourites since it not only stars Bunny, but Arya (another favourite) turns up in one of the most ridiculously over dramatic roles that I’ve seen outside of eighties Bollywood. And yet, this is a good thing! 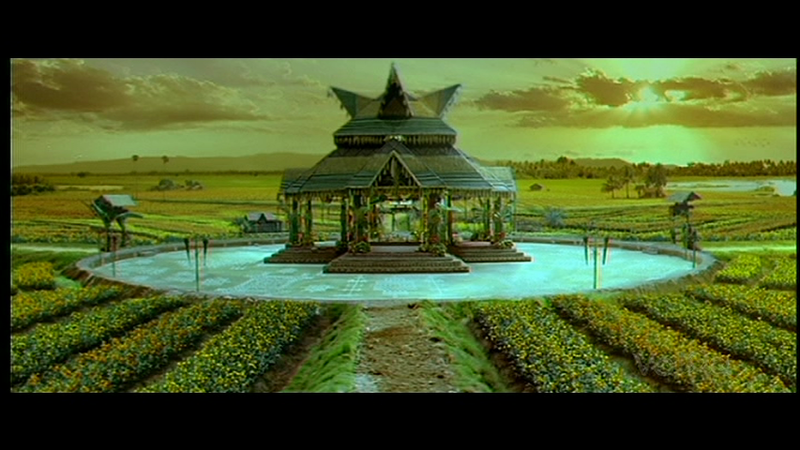 The film is overly romantic and slow to get going with a ridiculous story and dreadfully pretentious dialogue, but despite all these obvious flaws there is still a lot to enjoy in Varudu. 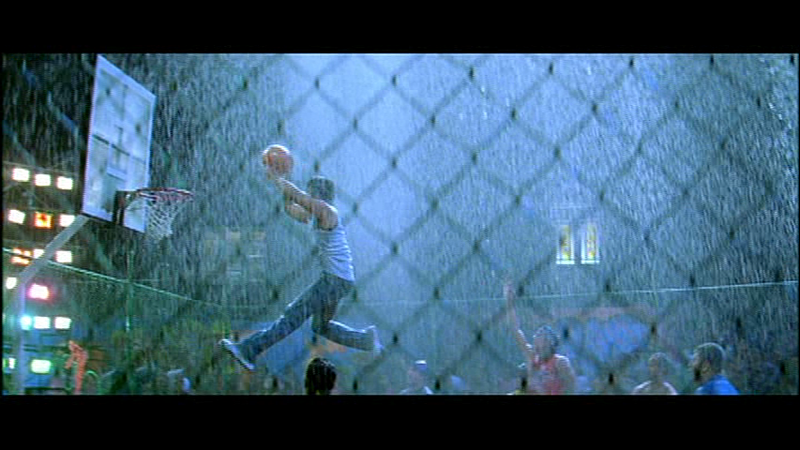 The opening scenes have nothing much to do with the rest of the film with Nisha (Sneha Ullal) attempting a dreadful Dhoom2-style Aishwarya Rai impression while Bunny demonstrates his skills on a motorbike and then on the basketball court. At least the rain makes Bunny’s hair look great, but otherwise it’s a clichéd hero introduction that leads into a rather disappointing song. This is after all a Bunny film, so my expectations for excellent choreography and great dance moves are high but the first song doesn’t make it in terms of either the music or the dancing. Thankfully though, both pick up considerably later. 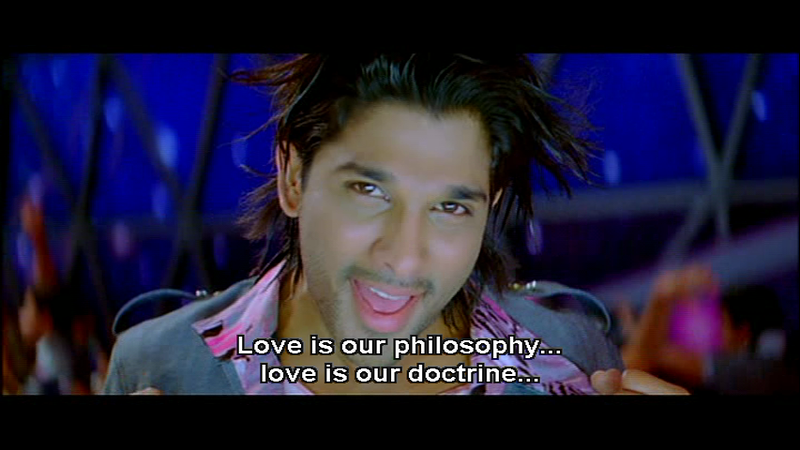 The first half of the film describes how Sandeep (Allu Arjun) wants a traditional arranged marriage even though the initial scenes show him happily helping out an elopement by his friends and complimenting his parents on their successful love marriage. The dialogue wants us to believe that he has just never found the right woman, although women are flinging themselves at him all the time, but these first scenes make him appear as if he’s just having too good a time to settle down and commit to one person. However moving overseas to start work is apparently the best time to decide to get married, so Sandy happily acquiesces to his family’s suggestion that he tie the knot before he goes. Not content with foisting the whole decision making process onto his parents, he then insists that he wants a full traditional 5 day wedding just like his grandparents, and has no desire to even see the girl is he is to marry. In fact he reminds me more of a sixteen year old girl with his declarations about love and excitement about a five day wedding rather than a mature and sensible man about to head off to start work in the US. However this is the least ridiculous part of the story (really!) and the build up to the wedding is actually rather sweet. Sandeep has a good relationship with his mother (Suhasini) and father (Ashish Vidyarthi) and their scenes together, and those with the rest of the family feel comfortable and generally realistic. There is a brief appearance by Brahmi as Dilip Raja, a marriage broker, but otherwise Varudu is fairly comedy uncle free with only a brief appearance by Ali later during the wedding song. The various wedding ceremonies, including the wonderfully colourful parade of the groom to the bride’s family, are pictured during a song. It’s rather long, but definitely well worth a watch for an insight into the wedding preparations and rituals. Besides which there is possibly the best form of wedding transport and some great costumes in the crowd as everything gears up for the big day. 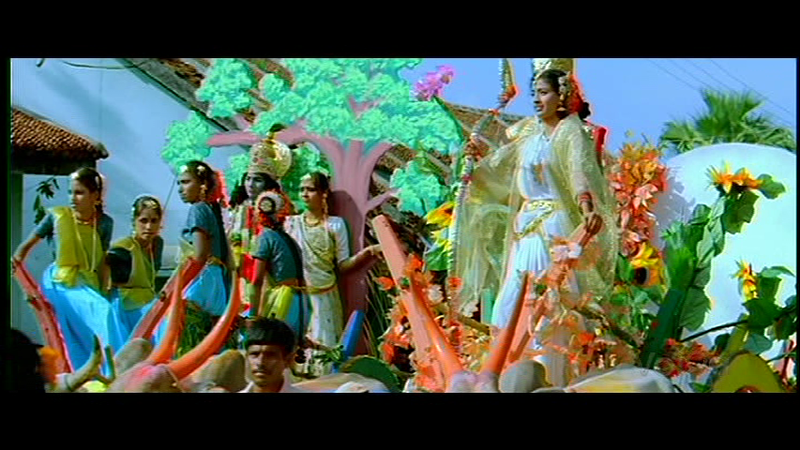 The costumes and jewellery for the wedding scene are superb even though the scenery relies heavily on CGI. We get to see the bride at the same time as Sandeep and although Deepthi (Bhanu Sri Mehra) doesn’t get very much screen-time (and even less dialogue), she does get some amazingly beautiful costumes. Although she is perhaps still just a little upstaged by Bunny in this song. After all the romance and slow development of the first hour culminating in the the dream wedding, there is a sudden change of pace in the second half. There is a disaster at the ceremony just before Sandeep ties the sacred thread and in the ensuing confusion the bride goes missing. Within the space of 3 minutes there is classic hero-style running, a bike chase (kudos to the wardrobe department as Bunny never loses his wedding turban) and an exploding petrol truck. It only gets more insane from here. Sandeep goes in search of Deepthi aided by the police force, but even with the top brass Comissioner Ahmed Khan (Nasser), Inspector Umesh Gupta (Brahmaji) and the Home Minister (Sayaji Shinde) involved they don’t appear to be making any headway. Sandeep has more luck chasing random black cars and dodging truck drivers who seem to be on a mission to drive him off the hunt. Finally his persistence pays off and there is a brief flashback to explain who has Deepthi and why. Not that it makes any sense, particularly when this is the villain’s introduction. Arya is Diwaker, one half of the ‘Kings from Hell’ brothers, and completely immersed in his life of drama as he lives out his psychotic fantasies cheerily calling out his catchphrase ‘Evil Power’ at random moments to emphasize his craziness. From his introduction the film careers even more off the rails as Arya hams it up for all he is worth as Diwaker and Sandeep declares his undying love for a girl he has barely met in some incredibly corny dialogue. There are a few good moments though. Sandeep proclaims (he doesn’t do anything as mundane as just speak by this stage) that Deepthi is his wife no matter what has happened to her during her ordeal. It’s a more modern touch that makes Sandeep’s character more appealing, although the shocked reactions of the family are rather less attractive. There are also some great chase sequences including some wonderful filmi medical magic and a ‘prisoner exchange’ on a bridge which allows director Gunasekhar to throw in lots of split screen moments. The final showdown is completely over the top and utterly nonsensical, but since it involves a shirtless Bunny and Arya fighting on top of giant cooling towers I’m not complaining! New heroine Bhanu Sri Mehra doesn’t really get much of a chance to make an impact. Her role is largely non-speaking and even when she does have something to say it tends to be a repetition of something Sandeep has earlier declaimed. I do like that she made an attempt to fight back when abducted, but quite frankly I’m disappointed that in all her time locked in a room she hadn’t made any attempt to barricade the door or fashion a better weapon. But at least she doesn’t just sit and whine and the make-up team did a good job making her look haggard after her experiences. The rest of the cast are all capable and do well in their roles, but ultimately the film is all about Bunny, and to a lesser extent Arya, so no-one else really gets much of a look in. The music by Mani Sharma does improve after the first song and overall I like the soundtrack. This song is my favourite, partly due to good choreography but also, who can resist random bouncing? Plus I admire Bunny’s dedication in dancing even when he is injured, seen here with his hand in a rather excellently bedazzled cast. 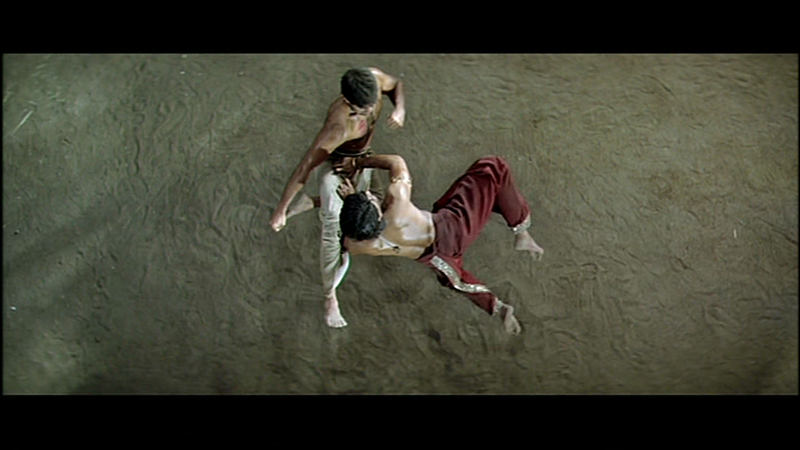 Varadu is self-indulgent, unashamedly melodramatic and has massive plot holes big enough to swallow a small planetoid. But despite that it’s heaps of fun and let’s be honest, I’m shallow enough to admit that Bunny and Arya are the major reasons why I enjoy this film. I’d love to watch some out-takes as I’m quite sure they struggled to keep their faces straight for most of their scenes together. I give Varudu 2 stars for the story but a full 5 stars for ensuring both Bunny and Arya spent as much time as possible without their shirts! This entry was posted in Tollywood and tagged Aahuthi Prasad, Allu Arjun, Arya, Ashish Vidyarthi, Bhanu Sri Mehra, Brahmaji, Brahmi!, Bunny, Gunasekhar, Mani Sharma, Nasser, Sayaji Shinde, sneha ullal, Suhasini, Suhasini Maniratnam, Telugu, Varudu. Bookmark the permalink. Finally…a good review of ‘Varudu’ is here! Some other reviews of this movie were so harsh that they did not even mention some of the ‘positive’ aspects of it…Perhaps, there were too many expectations from this movie and people were disappointed. I found the very idea of marrying someone without even looking at the person before marriage, forget meeting once or twice (as in the Indian arranged marriage system) unrealistic. ‘Sirf Tum’ /’Kadhal Kottai’ explored the idea of love without meeting someone quite nicely..it was not cheesy unlike in ‘Varudu’ where it seemed somehow artificial. Graphics were good but could be lessened. 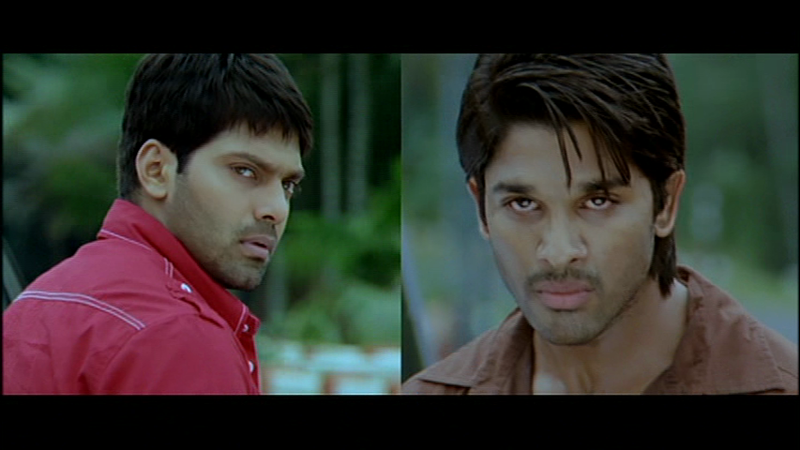 Acting and songs were good overall…Allu Arjun really lights up the screen…acts and dances so well! Bhanu Shri Mehra did well within her limitations…she can’t be blamed much for not being able to show her acting prowess. 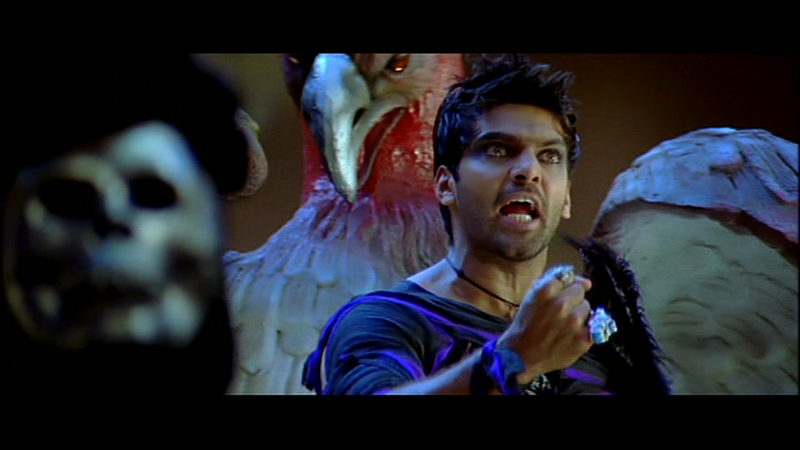 Arya makes for a good villain…although he did act OTT in some scenes. The supporting actors do justice to their roles. Songs…really good! 🙂 ‘Relaare Relaare’ is my pick-of-the-lot too! I just wish the movie would have been a little more realistic and less CGI-based…it would have really been a great flick to watch out then! I thought the actors were all pretty good in this – the problem was the story. 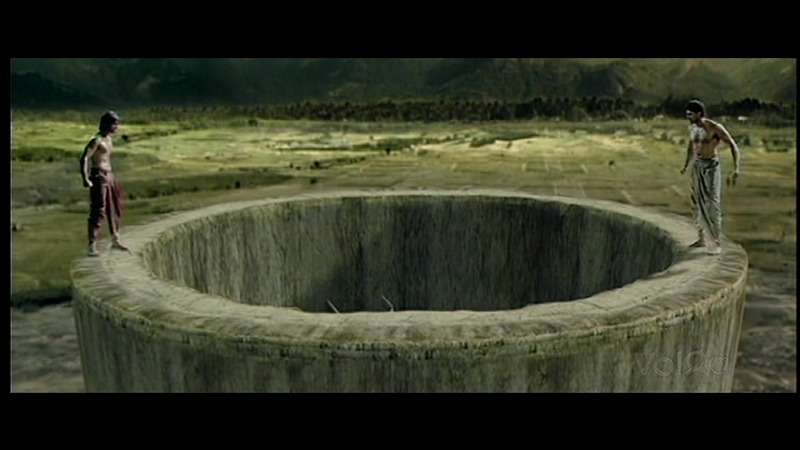 As you say, the premise was very unrealistic and the overuse of CGI, especially in the wedding sequence made it seem much more like a dream experience. I was waiting for the ‘wake-up’ moment, but it just seemed to segue into a nightmare! Even getting past the whole wedding idea, there were far too many places where the action didn’t follow on from the previous scenes and felt disjointed. I actually thought Bunny was fairly restrained and did an excellent job in the scenes with his family – so many of those felt very natural. If only the topic had been slightly different! But I do still love watching all the wedding scenes, and I love Arya’s completely insane villain! It’s rally a fun movie to watch – I’ve shown it to a few friends who have never even seen a Bollywood movie, and they loved it! I came across your blog when I searched for blogs on Sagara Sangamam…I would like to compliment you on your efforts for not only watching South Indian Cinema but also reviewing them so passionately. Kudos to both Temple and Heather. I read almost all of your reviews and found them to be honest…You seem to have a very good knowledge of actors…Try watching this movie http://www.youtube.com/watch?v=13TQ13cdrXg&wide=1…It’s directed by Thanikella Bharani garu and the movie revolves around only two characters. I have a feeling that you will like it…But at the same time I’m a bit concerned that you may not relate to most of the traditions depicted in the movie…I struggled to relate too as I was raised in an Indian city nevertheless this movie was an emotional roller coaster ride for me…. Thank-you very much for your kind words 🙂 We are both big fans and love watching films from the south of India. Thanks for the link too. it looks to be an interesting film, and the first ten minutes or so that I’ve watched were sweet. Unfortunately though I don’t understand Telugu, so my lack of understanding may be more due to that rather than anything else. Also, I loved your photos of Wales on your blog – it brought back memories of driving to Pembroke and Llanberis to go climbing!